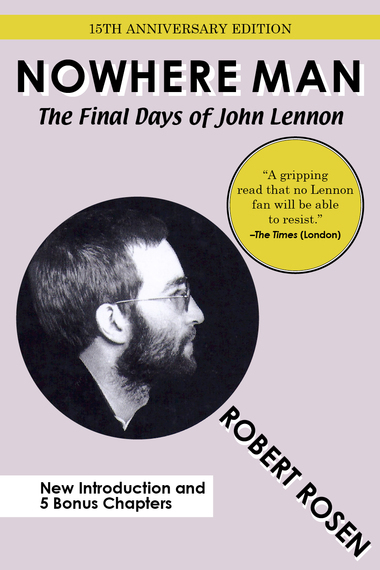 After feverishly reading Robert Rosen's updated 15th anniversary eBook edition of Nowhere Man: The Final Days of John Lennon, you feel like you are inside The Dakota with John Lennon and Yoko Ono. This isn't quite your average rock n roll biography. In a twist of fate, John Lennon's personal diaries landed in Rosen's lap on May of 1981, about a year and a half after the famed ex-Beatle was killed outside his apartment by a crazed fan. "Still, it was not until Wednesday, October 21, that I began the process of transcribing Lennon's diaries. It was exhausting work that continued unabated until the end of November. No matter how much I transcribed, there was always more; the task seemed endless. I forced myself into a routine that rarely varied: I woke up at 5 A.M., rolled out of bed and tore into the journals. Then, for the next 16 hours, fueled by coffee and amphetamines, I wrestled with Lennon's scrawls and codes and symbols. As I transcribed his words on my IBM Selectric, I said them out loud like an incantation, and I began to feel what seemed to be Lennon's energy flowing through me. For the first time I saw what his life was really like. I was in awe of his fanatical discipline, his total commitment to the self-imposed slavery of diary keeping. I'd never seen anything like it. He got it all down--every detail, every dream, every conversation, every morsel of food he put in his mouth, the perpetual stream of consciousness. And it was all an enormous contradiction. Here was a man who aspired to be like Jesus and Gandhi as much as he craved money and carnal pleasures. For Lennon, his journals were his religion." Then the diaries were gone. Fred Seaman, Lennon and Yoko's assistant, as well as Rosen's college friend, stole them back along with the videotapes, photos, Rosen's transcripts, and all the other Lennon stuff he brought over to Rosen's from The Dakota. Bob was left to recreate the diaries from memory as best he could. The book is a cross between journalism and imagination. After hanging in limbo for eighteen years, the book was finally published by Soft Skull Press in 2000. Rosen had a helluva time making it, but what about the book itself? What you find is a very rich rock star suffering from some kind of madness brought on by expectations and fame - a conflict between public and private personas. Lennon comes off as someone caught between materialism and spirituality, a great father to one child and a lousy father to another child, loving and petulant, someone all too human. The Lennon/Ono public statement on those five years of seclusion is that John Lennon was t a doting father and househusband, taking time away from public life to be a normal guy, but his diaries reveal an inner torment. Lennon is the perfect of example of the complexities of art and life. I know the records well. I feel like I know Lennon, much like I feel I know lots of artists through their work. Then you read something like this and remember that you don't. How can you know anybody in your own life, much less someone you never met who died when you were two? Of course, I knew how the book was to end and it still bothered me. Lennon's son, Sean, was around my own son's age when John Lennon was killed. It angers me that cataclysmic events in our lives are beyond our control. We are helpless in the face of that constant existential threat. There is nothing one can do. Behind all those songs we love was a person. Love may not be all we need, but we require a lot of it. It is easy to gawk, but harder to demonstrate self-control. The eBook edition gives us some of Rosen's insights into all the other Lennon biographies that have come out over the years. He did the homework. This is an important book and probably the last book I will read on The Beatles. This book would have made Lennon cringe. Here he stands naked - flawed, mean and beautiful. Nowhere Man is available here in eBook and here in the physical form.